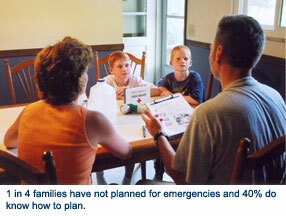 Your family might not be together when emergency happens. That’s why it is important to have a plan in place. Sit down and talk to your family about how you will reach each other in different situations. Make sure everyone in the family can get to a safe place and find each other in the event of an emergency. For instance, it is a great idea to designate two family meeting places, one in the neighborhood and one farther away. Consider contacting the same friend or family member by telephone or e-mail. Think about making an out-of-town family member or friend the contact. It might be easier to make a long-distance telephone call instead of a local call during an emergency. It could be easier for an out-of-town person to connect separated family members. You should plan for two situations – staying home or leaving. Deciding whether it is best to stay or go depends on the type of emergency. Officials may tell you what you need to do. In some cases, limited communication and information may require you to decide what is best for you and your family. Know where to go if you have to leave. Sometimes it may not be safe to stay in your home. Plan where your family can meet. Know where you will go and how you will get there if you have to leave your home. Family Safety Guides are available in print in English, Spanish, Bosnian and Braille and electronically in Romanian and Russian that outline the items that should be included in your emergency plan. Order your Family Safety Guide here.